New cryptocurrency - MastiffCoin [MAST]. through an initial 25,000 block Proof-of-Work phase. MastiffCoin has a default 88 coins per block but features two bonus SuperBlock phases. Mine the most profitable coins on the CoinKing.io multipool and get paid in MastiffCoin. Developers note: The Windows wallet will crash on the first startup, but will work perfectly after that. miners can still easily get MAST as well. No addnodes needed. MastiffCoin has supernodes built into the wallet. Ethereum Cloud Mining. Get 2.5% lifetime discount! / Free BTC. Lifetime 50% refbonus! 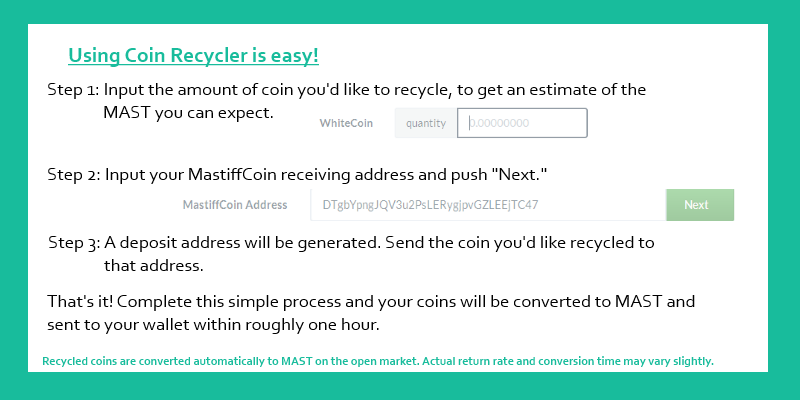 MastiffCoin is now MastCoin! Thanks goes out to our amazing community for their hard work and support during rebranding! Tell me something about their validation and currency status.